I have no problems with devotee’s translating books into English that were not done by Srila Prabhupada. What must be considered is: if we accept Srila Prabhupada as a guru or acharya then we must accept what he said about who is qualified and who is not to do this seva. One effect of this flood of new books by various devotees is that if you go to an ISKCON event or temple and visit the book table often one finds that these books are more prominently displayed and distributed than Srila Prabhupada’s books. Also when you get a book that has Prabhupada’s name on it as the translator and author the words contained in it, are not approved of by Prabhupada due to content being changed by conditioned souls even after his clear instructions where given to not change it. In this article we are going to discover directly from Srila Prabhupada what the qualifications are that one must have to write transcendental literature. On this same note when one edits a book rearranging or removing words that were approved by the acharya and uttama-adhikari devotee and replaces them with words that are of ones own choosing according to ones own mind and senses the same principals and rules apply. Many devotees are writing their own (or editing Srila Prabhupada‘s) Bhagavad-Gita, I guess they have not read these verses from the Caitanya-caritamrta? Or maybe they feel that Srila Prabhupada is not competent in his translations. They obviously consider that there is something lacking in Srila Prabhuapda’s Bhagavad-gita As It Is and believe they can make a better translation and commentary on the Gita than Prabhupada. A mood such as this, where one intentionally or unintentionally may impertinently put forward presentations that overstep or out do the previous acharya simply show that they are not qualified to write transcendental literature. Here Srila Prabhupada stresses that only a pure unalloyed advanced devotee can write transcendental literature and if a devotee who is not a very highly advanced being free from materially contaminated consciousness tries to write such literature it will be mundane and Prabhupada warns us “one should not touch it”. One of the not very well thought through arguments that inexperienced devotees give for unlimitedly changing Prabhupada’s books is that they will be more acceptable by mundane scholars. This argument is not based on any facts whatsoever because scholars prefer Prabhupada’s original books and do not respect changes to great personalities literary works. Also if we look at the bulk of reviews of Prabhupada’s books we will find that those reviews are reviews of Srila Prabhupada’s original pre-1978 editions, not the edited editions. Considering this fact, it is bazar that the editors of the BBT/BBTI claim they are making Srila Prabhupada’s books more acceptable to the likes and dislikes of mundane scholars and their ever changing standards of grammar and rhetoric. Please read on to see What our Acharya Srila Prabhupada has to say about this practice of catering to the constantly changing likes and dislikes of academia and rules of grammar. 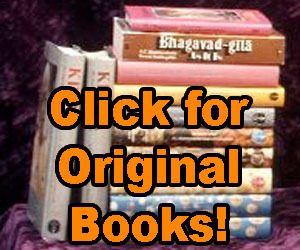 I want to get original shrila prabhupada books where can I get originals unadulterated BBT books. Only Shrila Prabhupada is worthy to be guru and he should be the only Diksha Guru (one must have two/three siksha guru teachers so if one or two fails one is left. I have direct experience of the corrupted Guru and their infestation of the Iskcon In the name of Krsna I curse the ones who play God with innocent seekers of Krsna I curse them to Atma Ha that their souls and 23 generations of their evil family’s souls be flung to the darkest region. I curse that those who are defying Jagad Guru and evil hiding in Radha Krsna devotees cloths immediately get disease and slowly and surely get exposed of their falsity and die to have their souls flung to the darkest region. All sincere devotees curse these changes by the impostors it is time to get back to the original track of our leader Jagad Guru. And in India you should be able to get from ISKCON Bangalore. I would like to begin a new relationship with you. Please forgive me for any past offences. The main thing is that now you have shown that you are following the system of diksa and paramapara, so I feel there should be no more issue between us. Furthermore, I can relate with many of your positions in defiance of the current leadership within ISKCON, especially the book changes. So, to show my fraternal spirit toward you, I have linked bookchanges.com to my traditionalist/conservative website, oneiskcon.com. Also, I would like to let you know that I am now distributing KBI books and getting much heat from ISKCON. Thank you for your nice thoughts and humble attitude. One thing you said that struck me is “many of your positions IN DEFIANCE of the current leadership within ISKCON, especially the book changes.” I don’t think of it as if I am “in defiance” against any one, or any ones position I am focused on the nonsense that is going on under the name GBC, BBT, BBTI, etc etc I am simply following Srila Prabhupada. If others in ISKCON or out of ISKCON want to fallow Srila Prabhupada and his clear instructions on management, printing of his books Diksa, or any other topic then that is wonderful and if others in ISKCON or out of ISKCON want to disregard Srila Prabhupada’s instructions then I am not going to blindly follow them to hell or any where else for that matter. I follow Srila Prabhupada because he is the Acharya. Its as simple as that. If by the grace of Krishna I have some realizations to share and some time to write them down about the reality of an issue that others may be confused about I will do it. That is not to defy devotee going against Prabhupada, it is to glorify Srila Prabhupada. I feel there is a vast difference. Simply defying persons is a waste of time. Glorifying the truth or helping the truth to be illuminated when it is covered by illusion is wonderful. That is why I have dedicated my life to daily distributing Prabhupada’s original books. The original books are like the sun of truth and purity and changed books are like the sun comming through a smog cloud both say to surrender to Krishna, but if given a choice what type of sun light one would like to have I am sure any sane thoughtful person will choose the pure light over the smog-contaminated-light. The more original books that are distributed the more the situation will be helped and the more the books are changed and those changes are distributed the more the situation will become worse. But to look on the bright side the worse it gets the more closer to the end of the nonsense we are coming. Good to hear from you Raya Nitai Prabhu! Hare Krishna…I am so CONFUSED now. So, is ISKCON and all its temples to be followed?? I want to be a devotee, but devotee of where and what temple??? Unfortunately ISKCON is not following Prabhupada so you will not get any benefit from following ISKCON. They will only confuse you and distract you from the actual teachings of Srila Prabhupada. So you should avoid the ISKCON temples and devotees. They can not help us come closer to Srila Prabhupada and Krishna. You need to take shelter of Srila Prabhupada by actually reading all of his books and following the instructions you find Srila Prabhupada giving you while you read his books. so , what shud we do now .? As you are saying ISKCON is not qualified ?? Please elaborate?? Prabhupada is qualified, Prabhupada is qualified to write transcendental literature… SO WE SHOULD READ PRABHUPADA’S ORIGINAL BOOKS. That is what I am saying…..
You can get PDF scans of the Original / Pre-1978 Srila Prabhupada books at http://innerschool.org/ … There is a torrent file containing almost all of his books– the more seeders, the better the share. I beg to differ. Prabhupada has also instructed us not to leave ISKCON for any reason. So I think you are misguiding people by giving them only a partial truth. If we are to follow Prabhupada perfectly we must follow ALL his instructions, not just few according to our taste and liking. 1. You are correct when you say follow Prabhupada’s original books. We do. I always quote from and suggest people to buy Original Macmillan edition of BG As It Is. 2. You are wrong when you say dont follow ISKCON. Prabhupada never wanted us to leave ISKCON even if we had some differences between. So we must all stay in ISKCON and preach from the original books of Prabhupada. I dont think anyone in ISKCON can stop you from following the original books. I live in ISKCON udhampur, I am a disciple of HH Navayogendra Maharaj, and I refer to original books by Prabhupada always. In fact my Gurudeva encouraged us to read original books by Prabhupada. So I think in this matter you are not correct. You should not try to break ISKCON. You should try to repair it. That will make Prabhupada really happy. Let us not kick each other. Let us help each other. And move together. Yes. If you can preach from and convince ISKCON to distribute and use Srila Prabhupada’s original books then that is good and all glories to your service! ISKCON is ultimately made up of devotees. And if the members of ISKCON decide to follow Srila Prabhupada’s instructions they find in Srila Prabhupada’s original books instead of following the deviations introduced by the so-called leaders then it will be good. They can replace the deviant leaders with leaders who are surrendered to Srila Prabhupada and it will be nice. Yes. Obviously the best thing is to stay in ISKCON and fix it.